Neil is able to draw or paint a commission for you. 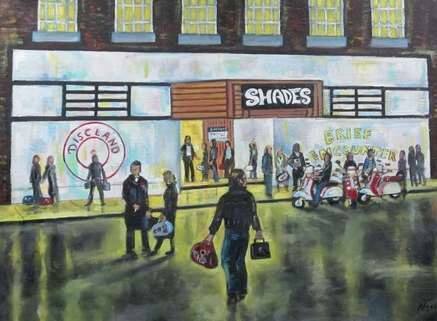 Neil has produced a range of Northern Soul commissions. These include individuals or groups at the Casino, in the crowd, or on the dance floor. You may want a friend on his or her scooter outside one of the great soul clubs as in "Scooters at the Casino Club" opposite. Pencil sketches start from £75, paintings from £225.We only ask for payment at the end of the process - when you are happy with the finished painting. All we need are your instructions and - if you've got any - some photographs to work from. If not, don't worry, we have lots of images for reference and Neil will always use his imagination! Opposite is a commission for the Shades club in Northampton. "I Go to Pieces" is a commission ordered in 2014. We've had 100 prints made of this image - it's one of our most popular images! The idea for "Long After Tonight is All Over" came from a client who had seen the photograph of the DJ Russ Winstanley standing among the ruins of the Casino after a fire destroyed the building in 1982. Why not add some ghostly figures dancing beneath the gaze of the Night Owl looking down from the roof? 2016 - two of Neil's latest commissions - "You're in My Heart" and "The Golden Torch."